CORAL GABLES, Fla. -- Thanks to a big finish, the North Carolina State Wolfpack are off to a start that draws comparisons to their first national championship season. Reserve Markell Johnson scored 20 points and the No. 18 Wolfpack shot 57 percent in the second half to rally past Miami 87-82 in the Atlantic Coast Conference opener for both teams Thursday. The Wolfpack (13-1) won their seventh game in a row and are off to their best start since the 1973-74 team that won the NCAA title. "We've got to follow their footsteps," Johnson said with a grin. "That's what we're trying to do." The Hurricanes (8-5) built their biggest lead at 74-64 with 10 minutes left, but the Wolfpack responded by scoring 13 consecutive points, and Devon Daniels' driving layup put them ahead to stay with 6 1/2 minutes to go. "Definitely a game to build on," Johnson said. "Being down 10 on the road to come back and win is big. We feel like we can come back from anything." Miami went nearly five minutes without a point and missed eight shots in a row. Both coaches said North Carolina State's superior depth took a toll on the Hurricanes, who rotate seven players and had two of them battling cramps in the second half. "I thought we would eventually wear those guys down," Wolfpack coach Kevin Keatts said. 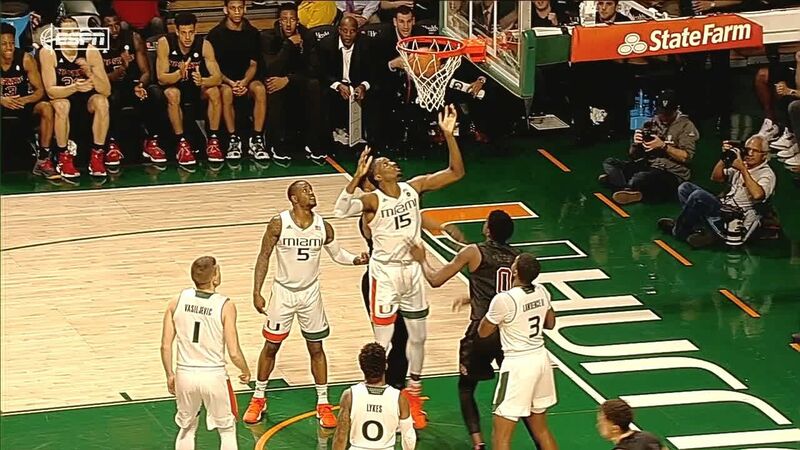 "That's going to be the issue all season," Miami coach Jim Larranaga said. "He was tremendous," Keatts said. "He controlled tempo at the end. He pushed the ball in transition and made some big shots for us." "He was the most west-rested player on the court the whole second half," Larranaga said. "He just played great. He had himself a complete game. He's very good, and we knew it." Daniels finished with 19 points for the Wolfpack, who outrebounded the smaller Hurricanes 51-29. Miami shot 29 free throws but sank only 16. "That was a heck of a game," Larranaga said. "My guys played their hearts out. If we had just made a few more free throws, it would have been a different outcome." The Hurricanes outscored North Carolina State 17-2 in the final five minutes of the first half to lead 45-37. The Wolfpack shot 37 percent in the first half and 46 percent for the game. "In the first half we got stagnant on offense," Daniels said. "Then we started moving the ball around more." The Wolfpack, who late last month cranked the rankings for the first time in nearly six years, will likely move even higher next week . N.C. State: Hosts No. 15 North Carolina on Tuesday. Miami: At Louisville on Sunday. Devon Daniels lays in it on the baseline drive to give NC State their first lead since the first half.